Llazar Semini, corrispondente dell'Osservatorio, traccia un profilo sulla situazione delle forze armate del paese delle aquile. I rapporti che in passato l'Albania ha intrecciato con le superpotenze, il collasso e il caos del 1997, i lenti passi verso una membership con l'Alleanza Atlantica. Questi i punti di osservazione entro i quali si snoda l'articolo di Semini. "There are so many other things to take care of and moreover Albania has got a young population. Thus the problem of evangelists who do not agree with the military service won't be a real problem for our country," says Alfred Moisiu, head of the Albanian Atlantic Association (AAA), acknowledging the existence of such a group of people in the tiny south-eastern European country. This is more than true. During the summit in Bucharest, Albania was almost openly told that the evangelist's problem is not so relevant and can be discussed later. At that summit ten former communist eastern European countries applied for NATO membership. A NATO summit in Prague next November will decide on the possible new members. Albania, the first country having applied for the Partnership for Peace (PfP) and for NATO membership, does not have the proper background to be accepted as a member. "We consider this membership not only a privilege to share common security with the Alliance, but also a responsibility for collective integration and defence," said Albanian Prime Minister Pandeli Majko at the summit held in Bucharest earlier this week. An AAA survey has shown that more than 99 percent of Albanians would like their country to become a NATO member, as stated by the Deputy Defence Minister. But Albanians should also consider that NATO membership does not only need proper military parameters, but also democratic ones, e.g. political and economical. When Joseph Ralston NATO - visited Albania on April 2nd last year, he declared that there had been good improvements in the army. But he also added that this doesn't mean that Albania could become a member of NATO before the end of the year, because "that decision would be a political one (TV Norba, April 2nd ). This was also confirmed by Pavli Zere, Deputy Defence Minister, told to Observatory on the Balkans, "NATO membership requires Albania's integration with the necessary political, democratic, juridical and financial parameters besides army restructuring." "Albania should work in all directions, not only renewing the army," repeats Moisiu, a former Defence Minister, adding that Albania was a very possible candidate until 1997, when the country was engulfed in a total anarchy of the Governmental structures. These were dismantled after the failure of the pyramid investment schemes. Nevertheless it should be accepted that the army is going ahead faster than the country's politics and economy. "At the moment we may say that at least the army stands on its feet following its collapse of 1997," said Zere. Because of its important geo-strategic position, Albania has always been under the careful attention of the "former superpowers". 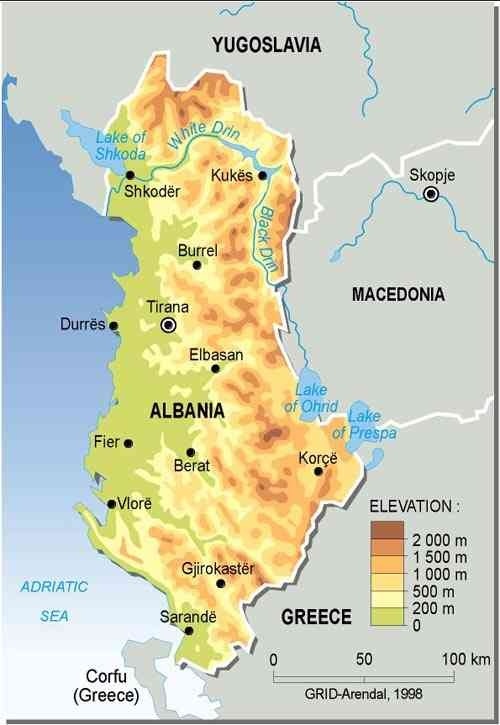 After World War II Albania became a former Soviet Union ally, it was assisted in its modernisation and was also provided with submarines, four of which remained with Albania when it broke diplomatic ties with Kruschev in 1961. This caused an enormous loss in military and economic aid by ex URSS. In 1968, after the Czechoslovakia case, Albania left the Warsaw Treaty. China continued the army supply as if Albania could put back the greatest "imperialist and social-imperialist occupation effort carried out by the United States or by the Soviet Union. ", but also because the Chinese Government considered it a good strategic opportunity to extend its tentacles near Europe. When Mao Tze Tung met the U.S., President Hoxha started disliking Beijing until he broke the ties with China. After that nothing was left. Neither Cuba nor South Korea would offer their previous assistance. Hoxha declared that Albania relied on its own, and this was practically impossible. The Albanian armed forces basically disintegrated in the chaos of 1997 and their re-organisation has been very slow and painful. Political infighting and accusations to the military's bias made by political parties did not help re-establishing the country's armed forces. Even without the problems happened in 1997, the services were however in urgent need of radical re-organisation and modernisation. The events that occurred in 1997 caused further economical damages to the Albanian army. During this period of anarchy, many weapons were taken out of the Army depots and stolen from the Albanian army garrisons. It was estimated that 650,000 firearms and other weapons - valued at about USD 450 million - ended up in the hands of the population. According to official figures, 187.000 weapons have been recovered until now. It looks unlikely that the Government will be able to meet an August 2002 deadline to fully disarm the population. Most of the remaining weapons, in fact, were no longer in Albania, but were used in Kosovo in 1998 and 1999. According to Pavli Zere, Albania is only destroying its light weapons, those that are old or that need too much money to be repaired, for example, hand grenades in Elbasan, central Albania. In 1998, Jayantha Dhanapala, the UN Assistant Secretary-General for Disarmament, stated that the number of looted weapons was: 226,000 AK-47 assault rifles, 351,000 ordinary rifles, 25,000 machine guns, 38,000 pistols, 2,450 grenade launchers and 770 mortars. The Government was also trying to recover some 1.5 million units of 7.62mm infantry munitions, one million anti-tank mines, 20,000 tons of explosives and 215,000 landmines. After the war in Kosovo in 1999 the mining situation became really problematic. During the military attacks the Serbian armed forces contaminated with mines 1,400 hectares from 200 meters to 400 meters inside the Albanian land. Albanian armed forces have been engaged in their collection and deactivation, thanks to the support of the Canadian government, whose total amount was about USD 800,000 for the destruction of 1.6 million mines. Not everyone agrees with this weaponry destruction, being Albania the only country in the region doing so. "Naturally, we need to reduce the weaponry in accordance with NATO standards. But that should be made carefully, because our neighbours (Macedonia) are getting and buying more and more weapons. We should not ignore NATO advice but we should also take care of ourselves," said Moisiu. Albania has had continuous assistance in bilateral agreements with NATO member countries. It is aiming at first restructuring and then modernising its army trying to reach NATO standards. Albania is at the moment re-organising its army with the U.S. support that has drafted a ten-year plan. NATO membership is a big goal of the Tirana government.The U.S. private company CAIK organized Albania's ten-year army reform program until 2010 with the Pentagon's approval. The document has already been signed and is currently being applied by the government. It aims to reform the Albanian army in two stages - until 2005 to restructure and in the next five years to modernise it. From the estimate number of 18,000 troops the army will be reduced to 16,500 forces with the NATO parameters. The government in Tirana aims at a constant expenditure increase for the army from its current 1.2 percent of the GDP to more than two percent as asked by NATO. All the foreign aid coming from bilateral agreements is based on the 10-year program reform. Albania has already established long-term cooperation with different countries, like Italy for logistics and Turkey for the naval base of Pasha Liman, based on the reform structure. The programme of restructuring includes various aspects. Albania, that currently has an army of about 18,000 forces in total, will reduce them to 16,500, plus 3,000 professionals. A gradual increase of the budget for the army has already been approved by the government until 2004. This year it has allocated USD 57 million, or 1.2 percent of its GDP. NATO requires that not less than two percent of the GDP budget should be for its members. The Deputy Minister said that the government, assisted by the western partners, is currently working for the increase of the personnel management, in order to turn it into a professional Army. This should start with training courses for cadets and officers, which include English lessons. Another aspect is that Albania is trying to increase the number of the non-commissioned officers - who run the small units - aiming at having 4,000 of them with a professional background and academic education. The big problem for the army remains the funding for such a small poor country. Much expenditure is operative, that is salaries and the like, e.g. the army is suffering from an exodus of trained officers into various specialised branches that operate against organised crime, where pay is much higher. "We are not doing much for the motivation of the future military generations," said Zere. "How would the next generation be attracted to serve in the army with such a salary of 20-30,000 leks (USD 140-200)?" It is probably positive that the government is thinking to offer better wages and accommodation to the new officers. Albania has sought to reorganise its armed forces and downsize its military to emphasise the value of rapid-reaction and deployment forces. The end of the conflict in former Yugoslavia and better relations with Greece coincided with a modernisation effort of Albania's army in conjunction with NATO and US support, and development aid. The threat from FRY forces in Kosovo prompted Albania and the international community to put additional efforts to restore a degree of functionality in the army. The Albanian army is organised into five branches - infantry, air, naval, logistics and Training Doctrine (TraDoc). It is organised in brigades and not in big dislocations. In terms of manpower, the army has an active strength of just over 18,000 soldiers. Over 30,000 males a year reach the conscription age of 19, but under 15,000 serve the 12-month service. Plans to reduce conscription term to 9 months are being studied. The envisaged plan is that to have a professional army of about 3000 troops, and to reduce the army to about 16.000 troops. Current doctrine was developed in the beginning of the 1990s. After Albania joined the North Atlantic Co-operation Council (NACC) and the PfP, its doctrine became more closely aligned with that of NATO, but it will need to be re-assessed to address both the internal and regional the situations. The country's primary military strategy remains one of self-defence. Albania is making significant strides in its efforts to gain NATO membership. A substantial percentage of Albanian assets have now been reassigned to various border-protection and domestic security duties, protection of the army depots and intervention in case of civil emergencies. "Albania does not expect an immediate invasion. The geo-political situation and the NATO presence in the region are many factors deciding on the national security strategy," said Zere.